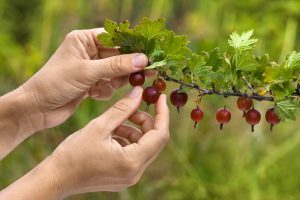 The gooseberry (Ribes uva-crispa) is a fruit bearing shrub, which is part of the Grossulariaceae family and which spontaneously grows on hilly and mountain areas. The importance of this shrub comes from the content of its fruits. The gooseberries are rich in vitamins and mineral salts. Here are a few worth mentioning benefits: the citric acid, the malic acid, the tartaric acid, cellulose, calcium, iron, phosphorus, potassium, sugars, vitamins C, A, B1, B2, P. All the previous mentioned benefits are a huge help for the human body. The gooseberries must not be excessively consumed. The maximum amount to be eaten per day is 200 gr. This is a wide-spread species. It can be found in Europe, Asia, North America. This is a rustic shrub, with a bush appearance. Its stems grow up to 1, 1.5 meter high. If has numerous stems, the old ones grow on the side, forming side, secondary roots. The bark has a gray color and thorns. The 2-3-year-old stems grow short, fruition branches, as bouquets. The stems have vegetative or mixed buds (which can bear fruit). The buds are conical, placed on both sides of the branches and with open scales on the superior side. The flowers are hermaphrodites, small and green. The flowers open up during early spring, the insects are responsible for the pollination. The leaves are compound leaves, with a circular shape and dimensions ranging from 2 to 6-cm. Some of the leaves can have small hairs, while the other may not have hairs. The fruits have a globular shape and can either have hairs or not. The fruits also have a lot of black seeds, with a sour taste and they reach maturity somewhere in June-July. This species prefers moist and wet environments and it has low temperature expectations. The optimum temperatures for the vegetation period are between 15 to 25 degrees Celsius. During winter, it can withstand temperatures as low as -32 degrees Celsius, during summer it cannot live if the temperatures exceed 40 degrees Celsius. If the outside temperatures exceed 30 degrees Celsius, the shrub will start to wilt, even if the soil temperature will be the correct one. The gooseberry shrub like the areas where there are around 700 mm of rain per year, but it does not like the excess soil humidity. You need to be careful with this shrub’s water requirements during its growth phase and fruit maturing phase. This plant does not have any temperature requirements. If like slightly shadowed parcels, it does not like a strong, direct sunlight. It does not like poor and salt infused soils. It grows well on light soils, which have a lot of mineral supplies. The soils’ pH must range from 4.6 to 5 and the groundwater must not be more than 1.2 meters away. The parcels chosen for starting a gooseberry crop must not be in contact with cold air currents and strong winds. In warmer areas, pick parcels alongside the rivers, in order to create a favorable micro-climate. In hilly areas, choose soils which have a western or eastern exposure and, in the mountains, the parcel must have a southern exposure. Preparing the soil consists of collecting all the vegetal residues, levelling the soil, fertilizing and ploughing it. These procedures all need to be carried out 1-3 months before planting the crop. The soil must be ploughed at a 25-35-cm depth. Once these procedures have been carried out, the soil must be fertilized using organic compost, 50-60 tons per hectare, or chemical fertilizers, such as the complex NPK fertilizer. The optimum planting period is during autumn, the last days of October. If, for certain reasons, you cannot plant the gooseberries during autumn, this step can also be carried out during spring. The distances used when planting needs to be selected in accordance to the crop technology. 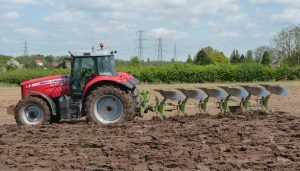 The following planting schemes are recommended: 2.5-3-cm distance between the rows and 0.8-1-m distance between the plants on each row, for the small species. For the larger species, the distance from the plants on a row must be 1.2-1.5-m. After selecting the correct planting scheme, the soil must be marked. The following step are: digging the holes and the actual planting. The holes can either be manually or automatically dug. The dimensions of the holes must be 40 x 40 x 40 cm. Put 5-6-kg of well decomposed organic compost in each hole. Right before planting, the seedlings must have their roots cleaned. This process consists of taking out the wounded areas of the roots. 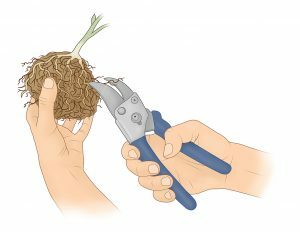 The old or dead roots must also be taken out and the healthy ones must be shortened, leaving them at a 10-15-cm length. After this, the roots must be put in a mixture of yellow soil, cattle organic compost and water. This layer will help the shrub adapt to the new environment conditions. This mixture must have a sour-cream like consistency. The planting process must be carried out by 2 people, because the roots must be well spread in the hole and the plant must be in a vertical position. A person needs to hold the plant in the needed position and the second person must fill in the hole and lightly press the soil surrounding the plant. 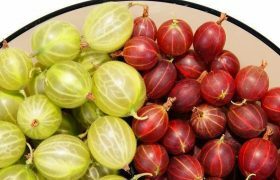 The most common gooseberry species are: Verda, Virens, Sirius, Jubilar, Somes, Zenit, White Smith, Cernomor. During the first 2-3 years after planting, pay attention to taking care of the soil. The weeds that grow spontaneously, consume the water and nutritious elements destined for the gooseberry crop. If not destroyed, the gooseberries will slowly grow, and their production will be decreased. The soil can be kept clean by superficially ploughing the soil. These ploughs can be done either mechanically or manually. Starting with the fourth year, the distance between the rows can be planted with herbaceous plants (clover, fescues, ryegrass, etc.). These can be mowed every time they reach a 15-20-cm height. For an intensive crop system, during the long dry seasons, the crop must be irrigated. During the vegetation period, the crop must be watered 5-7 times, using 350-400 cubic meters per hectare. 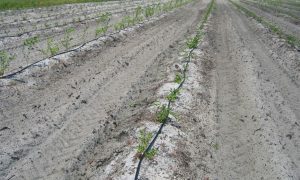 We recommend using sprinkler or drip irrigation. The crop must be constantly watered, because the gooseberry doesn’t have a deep root system and the roots are destroyed by the drought. Additional fertilizing is necessary if you plan on having large productions. We recommend applying chemical fertilizers annually, such as NPK (15:15:15 or 20:20:20). The dosage must be calculated in accordance to the desired production, the soil’s properties and the other fertilizers which have already been applied. We recommend applying the fertilizers in 2-3 doses, during the sprouting stage and mid-June. Leaf fertilizers can also be used. We recommend staking or supporting the plants. The supporting system must be installed before planting or right after it. These systems must be formed of 2-3 stakes and threads. The stakes must be 1.8 meters high and they must be 40-cm deep into the soil. The recommended distance between the stakes must be 8 meters. For more information about the diseases and pests which affect the gooseberry crop, as well as the correct prevention means, please click here. Bush shaped gooseberry: right after planting, the stem must be shortened so that they are 20-cm tall. 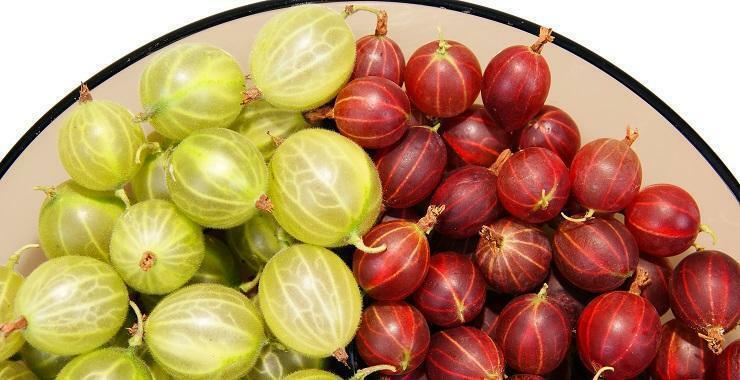 This will help the gooseberry grow newer, thicker and more vigorous stems. During the second vegetation year, pick 3-4 stems and shorten them by 30%. During the following years (3, 4 and 5), pick 3-4 stems and do the same. 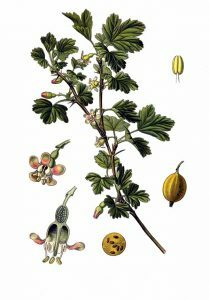 The stems which have been shortened during these years will form the gooseberry’s foliage. During these years, no other cuts needs to be applied. Trunk shaped gooseberry: after planting, the stems must be shortened after the first 2-7 buds. After 2 years, during spring, pick 3-4 branches, uniformly located throughout the shrub, and shorten them by 30%. The remaining plant growths must be taken out. 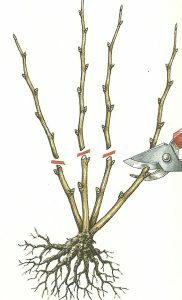 On the third year, during spring, pick a few branches, which are uniformly spread throughout the shrub, and shorten 30% of their length and take out the remaining growths. If during the fourth year, no other parts grow longer than 15-cm, apply even more severe cuts to stimulate the growth. During the fifth year, pick 3-4 new branches and shorten them by 30%. The cut performed after the foliage has been formed are intended to help in the growth of fruit bearing branches. These cuts also air the shrub, making the fruits benefit from an optimum sunlight amount. The fruition cuts need to be applied during February, before the emerge of the first leaves. Take out the branches which are older than 5 years and keep 12 young branches (of 2-3 years old). Reduce them by 2 thirds of their initial length. Take out the branches which grow inside the foliage and the ones which grow very close to the soil. You must also take out the branched which were affected by frost bite and the ones which have been destroyed by pathogens. This process can be done differently, depending on the production’s purpose. If the fruits were destined to be processed, these need to be harvested starting in May, when they are still green. If the fruits are destined to be consumed fresh, these need to be harvested once they reach their full maturity. The correct harvesting time can be observed by: the fruit’s peel which becomes transparent, the pulp becomes softer and it has the specific taste and aroma. The fruits need to be harvested along their peduncle, during a dry and chill day. This process can be performed either manually or mechanically.